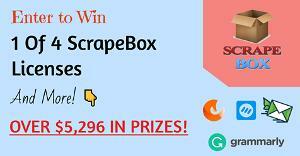 Prize: ScrapeBox License Plugin Bundle 3-month Managed Windows VPS Hosting for ScrapeBox 3-month free access to ConvertFox 3-month free access to ContentStudio Small Business Agency Plan 3-month free access to Ninja Outreach Enterprise and more!!! What you must do to enter: Enter your email address to join and to accept a free newsletter, then do as many tasks that you can on the giveaway form for more chances of winning! Giveaway is open WORLDWIDE but void where prohibited by law. Statistics: This contest was opened by 107 and entered by 2 ContestChest.com members. 2% of those who opened the contest, entered it.